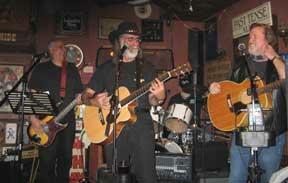 I occasionally sub with Rough House, a Central-Coast country-rock four-piece: Tony Petruzzi and Bob Barr play guitars, with Woody Woodsmall on drums. (Former founding member Michael McCabe is shown in the photo below.) Regular bassist Mickey Gwynn isn't in the photo. 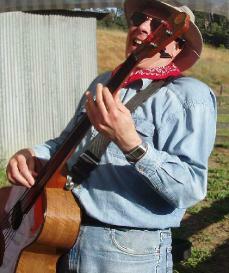 The late Sheri Odenwald played a solo acoustic gig in Cambria for decades. We played together from 2004-2008. Sheri had a great voice, and she covered a wide variety of folk and pop favorites. I usually played fretless to add more texture and occasional lead lines to the music. I had occasionally played with some Cambria friends in a loose-knit band called The Center Street Mercantile And Blacksmith String Band. 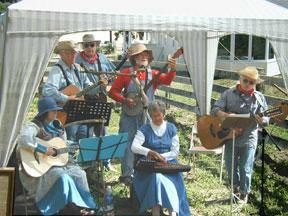 They play some old folk songs, some singalongs, and just generally have fun. You can sometimes catch the CCMBSB at some of the local fund-raisers here in town. I played for about a decade, on and off, with Keith and Linda Barbour, Scott Bailey, and Matt Franscioni in an acoustic group called "Beaujolais" (Keith, Linda and I had been performing together since 1994 as a trio, called KLR) We performed a collection of originals, jazz standards, folk favorites, even a little country — whatever whatever sounds good. We took our name from the saucy French wine, synonymous with spontaneous celebration. 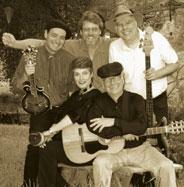 From 1995 to 2001 in the San Jose area, I played with The Golden State Ramblers, a quartet playing classic old standards, folk favorites, Irish tunes, children's songs, novelty tunes, and whatever else strikes their fancy. With three-part vocals (occasionally four), acoustic guitar, mandolin, violin and bowed musical saw, we had lots of fun. After spending three months recording their first album, I was invited to join and add bass to their sound. Not in any particular order, and without regard for how much we've played together. The city name is home for the musicians, not necessarily the location of the gig.